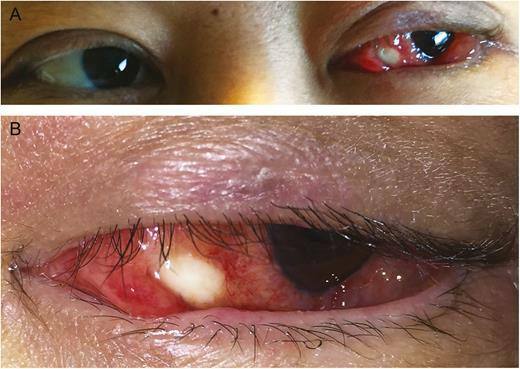 A woman in her mid-forties presented to the Emergency Department with worsening left eye erythema and swelling despite topical antibiotics and steroids. She had been diagnosed with acute myelogenous leukemia (AML) and started on chemotherapy 24 months prior. Physical exam revealed a 3 mm × 5 mm elevated white nummular conjunctival lesion with surrounding injection and chemosis. The cornea was clear; the anterior chamber was deep and quiet; the iris, lens, and vitreous were normal. On fundoscopic exam the macula, vessels, choroid, and retina were normal. Visual acuity was 20/40 and 20/20 in the affected and contralateral eyes, respectively. She endorsed mild tenderness with palpation over the left maxillary sinus. There were no rashes, mucosal lesions, or lymphadenopathy. Her pulmonary, cardiac, abdominal, neurologic, and musculoskeletal exams were benign. Laboratory testing revealed an absolute neutrophil count of 1500 cells/uL, absolute lymphocyte count of 420 cells/uL, voriconazole level of 2.7 mcg/mL, normal liver enzymes and creatinine, and plasma CMV PCR 0 IU/mL. Maxillofacial computed tomography imaging revealed uncomplicated left orbital preseptal cellulitis. 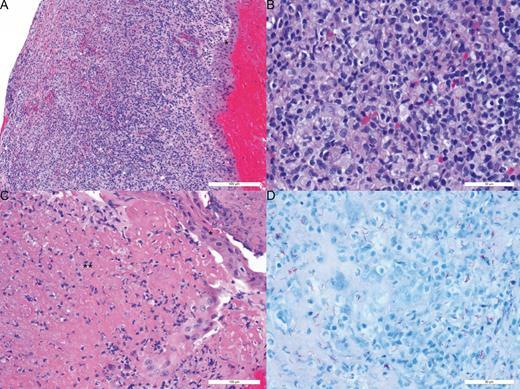 Histopathological examination of the conjunctival nodule demonstrated hemorrhagic and partially necrotic tissue with extensive nongranulomatous lymphohistiocytic and neutrophilic inflammation. The specimen was also sent for culture. However, acid-fast bacilli (AFB) culture and pathology revealed AFB by Ziehl-Neelsen and Fite stains with associated necrosis and lymphohistiocytic inflammation (Figure 3). Polymerase chain reaction (PCR) confirmed a diagnosis of ocular tuberculosis. The isolate was susceptible to the medications in RIPE (rifamycin, isoniazid, pyrazinamide, and ethambutol), her initial treatment regimen.